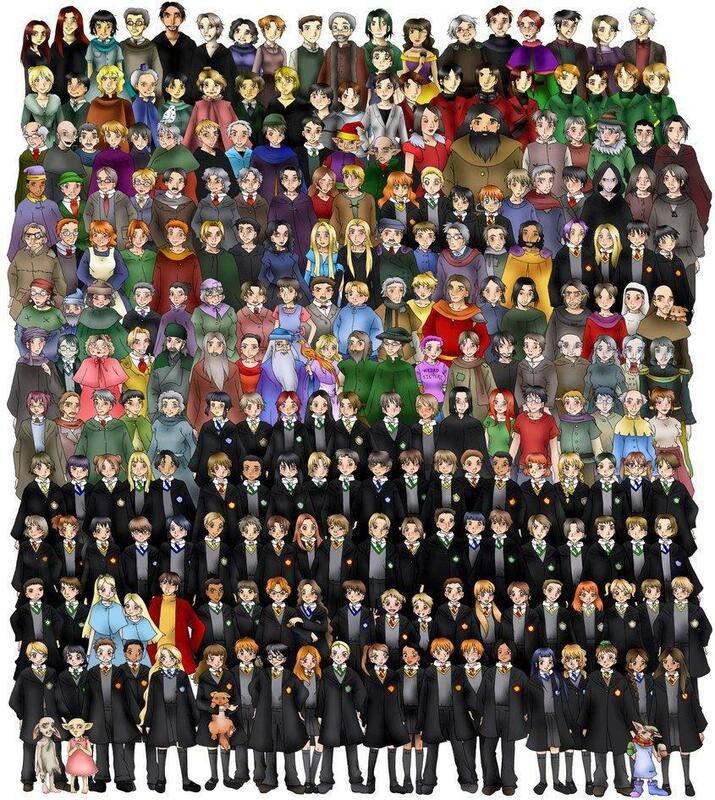 Si de verdad eres fans de Harry Potter, nombren todos los personajes que aparecen en el dibujo. ← Scream Awards 2011: ¡Harry Potter con 6 premios!. wow, soy fan de Harry Potter… pero son muuuuuchos personajes! Distingo a algunos, fleur y su hermanita gabrielle, dumbledore y fauxes… todos los house elves: kreacher, winky, dobby… pero hay otros que ni se quienes son! JAJAJAJAJA que divertida imagen… y un buen recuerdo. Di un poquito mas de tiempo… Pero la verdad, para mi fue casi imposible. Deicy si pudo. Mañana voy a poner todos los nombres. Zacharias Smith, Pansy Parkinson, Kreacher, Winky Seamus Finnigan, Dean Thomas, Luna Lovegood, Hermione Granger, Crookshanks, Ronald Weasley, Harry Potter, Ginny Weasley, Draco Malfoy, Lavender Brown, Angelina Johnson, George Weasley, Fred Weasley, Lee Jordan, Cho Chang, Marietta Edgecomb, Neville Longbottom, Trevor, Dobby, Padma Patil, Parvati Patil. Vincent Crabbe, Gregory Goyle, Fleur Delacour, Gabrielle Delacour, Viktor Krum, Blaise Zabini, Millicent Bulstrode, Percy Weasley, Penelope Clearwater, Michael Corner, Colin Creevy, Dennis Creevy, Oliver Wood, Katie Bell, Alicia Spinnet, Cedric Diggory, Susan Bones, Hannah Abbot, Justin Finch-Fletchley, Ernie Macmillan. Vicky Frobisher, Demelza Robins, Romilda Vane, Terry Boot, Roger Davies, Owen Cauldwell, Mandy Brocklehurst, Ritchi Coote, Natalie McDonald, Jimmy Peakes, Terence Higgs, Geoffrey Hooper, Marcus Flint, Anthony Goldstein, Miles Bletchley, Montague, Theodore Nott, Graham Pritchard, Adrian Pucey, Orla Quirke. Wayne Hopkins, Moray Macdougal, Megan Jones, Daphne Greenglass, Kevin Entwistle, Leanne, Vaisey, Eileen Prince, Urquhart, Harper, Stweart Ackerley, Malcolm Baddock, Eleanor Branstone, Cormac McLaggen, Euan Abercrombie, Eloise Midgen, Laura Madley, Andrew Kirke, Lisa Turpin, Warrington. Bertha Jorkins, Rufus Scrimgeour, Edgar Bones, Amelia Bones, Grubbly-Plank, Su Li, Cadwallader, Tracy Davis, Sally-Anne Perks, Stephen Cornfoot, Jack Sloper, Marcus Belby, Severus Snape, Lily Evans, James Potter, Bob Ogden, Binns, Xenophilius Lovegood, Madame Rosmerta. Quirrel, Moaning Myrtle, Dolores Umbridge, Gilderoy Lockhart, Igor Karkaroff, Percival Dumbledore, Kendra Dumbledore, Albus Dumbledore, Fawkes, Ariana Dumbledore, Aberforth Dumbledore, Minerva McGonagall, Nymphadora Tonks, Remus Lupin, Sirius Black, Peter Pettigrew, Fat Friar, Grey Lady, Nearly Headless Nick, Bloody Baron. Sybil Trelawney, Professor Flitwick, Pomona Sprout, Madame Hooch, Madame Pince, Arabella Figg, Marge Dursley, Petunia Dursley, Vernon Dursley, Dudley Dursley, Mr. Ollivander, Helga Hufflepuff, Godric Gryffindor, Rowena Ravenclaw, Salazar Slytherin, Fenrir Greyback, Madame Malkin, Poppy Pomfrey, Argus Filch, Mrs. Norris. Alastor Moody, Arthur Weasley, Molly Weasley, Bill Weasley, Charlie Weasley, Yaxley, Rodolphus Lestrange, Bellatrix Lestrange, Narcissa Malfoy, Lucius Malfoy, Horace Slughorn, Stan Shunpike, Ernie Prang, Mundungus Fletcher, Hassan Mostafa, Teddy Lupin, Victoire Weasley, James Potter (jr.), Albus Severus Potter. Kingsley Shacklebolt, Cornelius Fudge, Amos Diggory, Rita Skeeter, Barty Crouch, Alecto Carrow, Amycus Carrow, Antonin Dolohov, Andromeda Tonks, Ted Tonks, Rose Weasley, Scorpius Malfoy, Lily Potter, Hugo Weasley, Piers Polkiss, Marvolo Gaunt, Tom Riddle, Voldemort, Merope Gaunt, Morfin Gaunt. Nicholas Flamel, Tom, Newt Scamander, Madame Puddifoot, Hestia Jones, Hedwig, Perenell Flamel, Barty Crouch (jr.), Benjy Fenwick, Ludo Bagman, Mr. Borgin, Peeves, Griphook, Madame Maxime, Rubeus Hagrid, Frank Longbottom, Alice Longbottom, Grandma Longbottom, Walden Mcnair, Regulus Black. Apolline Delacour, Monsieur Delacour, Gellert Grindelwald, Elphius Dodge, Mafalda Hopkirk, Hepzibah Smith, Charity Burbage, Thorfinn Rowle, Gordon, Malcolm, Mary Dorkins, Jim McGuffin, Bimitrov, Levski, Ivanova, Aidan Lynch, Moran, Mullet, Barry Ryan. Araminta Meliflua, Rabastan Lestrange, Mary Cattermole, Reginald Cattermole, Albert Runcorn, Pius Thicknesse, Bathilda Bagshot, Hetty Bayliss, Angus Fleet, Gregorovitch, Mark Evans, Stubby Boardman, Celestina Warbeck, Dedalus Diggle, Broderick Bode, Muriel Weasley, Dawlish, Dorcas Meadowes, Frank Bryce. Creo que faltan muchos más a parte de los Señores Granger :), pero sí, es una pena que no hubiéramos visto más acción de ellos. Zacharias Smith, Pansy Parkinson, Kreacher, Winky Seamus Finnigan, Dean Thomas, Luna Lovegood, Hermione Granger, Crookshanks, Ronald Weasley, Harry Potter, Ginny Weasley, Draco Malfoy, Lavender Brown, Angelina Johnson, George Weasley, Fred Weasley, Lee Jordan, Cho Chang, Marietta Edgecomb, Neville Longbottom, Trevor, Dobby, Padma Patil, Parvati Patil,Vincent Crabbe, Gregory Goyle, Fleur Delacour, Gabrielle Delacour, Viktor Krum, Blaise Zabini, Millicent Bulstrode, Percy Weasley, Penelope Clearwater, Michael Corner, Colin Creevy, Dennis Creevy, Oliver Wood, Katie Bell, Alicia Spinnet, Cedric Diggory, Susan Bones, Hannah Abbot, Justin Finch-Fletchley, Ernie Macmillan,Vicky Frobisher, Demelza Robins, Romilda Vane, Terry Boot, Roger Davies, Owen Cauldwell, Mandy Brocklehurst, Ritchi Coote, Natalie McDonald, Jimmy Peakes, Terence Higgs, Geoffrey Hooper, Marcus Flint, Anthony Goldstein, Miles Bletchley, Montague, Theodore Nott, Graham Pritchard, Adrian Pucey, Orla Quirke, Wayne Hopkins, Moray Macdougal, Megan Jones, Daphne Greenglass, Kevin Entwistle, Leanne, Vaisey, Eileen Prince, Urquhart, Harper, Stweart Ackerley, Malcolm Baddock, Eleanor Branstone, Cormac McLaggen, Euan Abercrombie, Eloise Midgen, Laura Madley, Andrew Kirke, Lisa Turpin, Warrington, Bertha Jorkins, Rufus Scrimgeour, Edgar Bones, Amelia Bones, Grubbly-Plank, Su Li, Cadwallader, Tracy Davis, Sally-Anne Perks, Stephen Cornfoot, Jack Sloper, Marcus Belby, Severus Snape, Lily Evans, James Potter, Bob Ogden, Binns, Xenophilius Lovegood, Madame Rosmerta.Quirrel, Moaning Myrtle, Dolores Umbridge, Gilderoy Lockhart, Igor Karkaroff, Percival Dumbledore, Kendra Dumbledore, Albus Dumbledore, Fawkes, Ariana Dumbledore, Aberforth Dumbledore, Minerva McGonagall, Nymphadora Tonks, Remus Lupin, Sirius Black, Peter Pettigrew, Fat Friar, Grey Lady, Nearly Headless Nick, Bloody Baron,Sybil Trelawney, Professor Flitwick, Pomona Sprout, Madame Hooch, Madame Pince, Arabella Figg, Marge Dursley, Petunia Dursley, Vernon Dursley, Dudley Dursley, Mr. Ollivander, Helga Hufflepuff, Godric Gryffindor, Rowena Ravenclaw, Salazar Slytherin, Fenrir Greyback, Madame Malkin, Poppy Pomfrey, Argus Filch, Mrs. Norris, Alastor Moody, Arthur Weasley, Molly Weasley, Bill Weasley, Charlie Weasley, Yaxley, Rodolphus Lestrange, Bellatrix Lestrange, Narcissa Malfoy, Lucius Malfoy, Horace Slughorn, Stan Shunpike, Ernie Prang, Mundungus Fletcher, Hassan Mostafa, Teddy Lupin, Victoire Weasley, James Potter (jr.), Albus Severus Potter, Kingsley Shacklebolt, Cornelius Fudge, Amos Diggory, Rita Skeeter, Barty Crouch, Alecto Carrow, Amycus Carrow, Antonin Dolohov, Andromeda Tonks, Ted Tonks, Rose Weasley, Scorpius Malfoy, Lily Potter, Hugo Weasley, Piers Polkiss, Marvolo Gaunt, Tom Riddle, Voldemort, Merope Gaunt, Morfin Gaunt, Nicholas Flamel, Tom, Newt Scamander, Madame Puddifoot, Hestia Jones, Hedwig, Perenell Flamel, Barty Crouch (jr.), Benjy Fenwick, Ludo Bagman, Mr. Borgin, Peeves, Griphook, Madame Maxime, Rubeus Hagrid, Frank Longbottom, Alice Longbottom, Grandma Longbottom, Walden Mcnair, Regulus Black, Apolline Delacour, Monsieur Delacour, Gellert Grindelwald, Elphius Dodge, Mafalda Hopkirk, Hepzibah Smith, Charity Burbage, Thorfinn Rowle, Gordon, Malcolm, Mary Dorkins, Jim McGuffin, Bimitrov, Levski, Ivanova, Aidan Lynch, Moran, Mullet, Barry Ryan, Araminta Meliflua, Rabastan Lestrange, Mary Cattermole, Reginald Cattermole, Albert Runcorn, Pius Thicknesse, Bathilda Bagshot, Hetty Bayliss, Angus Fleet, Gregorovitch, Mark Evans, Stubby Boardman, Celestina Warbeck, Dedalus Diggle, Broderick Bode, Muriel Weasley, Dawlish, Dorcas Meadowes, Frank Bryce. Además, no soy un verdadero fan o no por saberme todos los nombres de personajes que ni siquiera aparecen en los libros o en las películas… Y si los supiera, sería imposible reconocerlos por lo mal dibujados que están!!! Cómo distingo a Bill de Charly si no tiene cicatrices? Cómo se que es Petunia Dursley si no tiene el cabello rubio? Etcétera, etcétera. No me gustó esto la verdad. Y opino porque quiero y porque es 2018… Ya cada uno hace lo que se le cante el cul*. Gracias. Aparte no aparece Astoria Greengrass, que por cierto es GreengRass no GreengLass como está escrito el nombre de su hermana. Es pasto verde, no vidrio verde. Ok? Ni siquiera está Grawp o Buckbeak!!! Además del señor y señora Granger que su ausencia ya es mencionada unos comentarios más arriba por otros usuarios. La que hizo este dibujo se olvidó de personajes conocidos por poner a otros que la mayoría no conoce, no porque seamos menos potterhead sino porque, como dije anteriormente, no son nombrados en ningún lugar. Fueron apareciendo con el tiempo y por lo tanto nadie recuerda con detalle cómo eran exactamente para distinguirlos en el dibujo, además que la autora de esta “obra” no hubiera respetado ningún detalle que nos ayude a reconocerlos por más que la vida le fuera en eso.